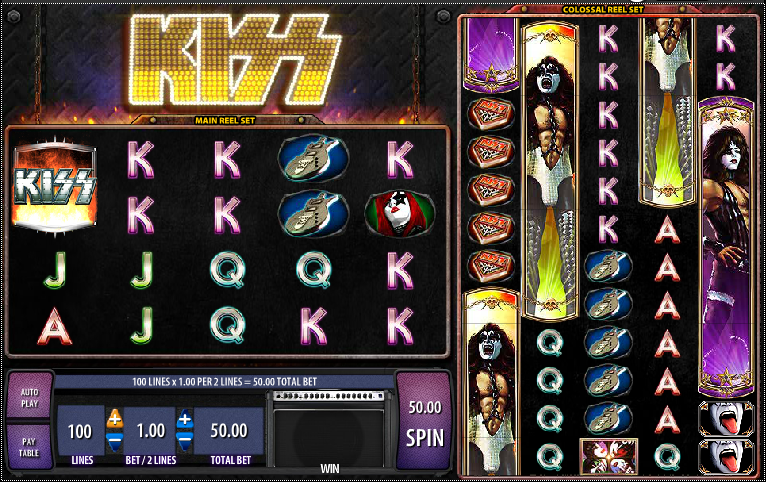 The band ‘Kiss’ are one of the most iconic names in the history of American rock music; formed way back in 1973 in New York and fronted by the one and only Gene Simmons, Kiss costumes and stage performances are always memorable and this new online slot from WMS Gaming aims to bring some of that excitement to the reels. The first thing you notice that about Kiss is that it features two separate reels on screen; on the left is a fairly standard five reel setup while on the right is what WMS calls it’s Colossal Reel Set. This comprises five reels but also twelve visible rows. The two sets of reels are not linked but provide a total of 100 paylines. The low value symbols are the J, Q, K and A while the higher value ones are a Kiss badge, a guitar, a red headed band member and Gene Simmons famous tongue. There’s a wild symbol which contains all four band members and a Kiss symbol which triggers the bonus round. Both reel sets also features some band member characters which cover a number of places on one reel. Although we said above that both reels operate independently, that’s not entirely true; if you can adjacent wild symbols on a reel in standard gameplay, the corresponding reel will also become completely wild in the Colossal Reel Set. Although not perhaps as graphically impressive as some other slots around, the second reel set and the Kiss music featured during gameplay goes a long way to make up for any shortcomings. Gene Simmons himself comments on the game on the WMS Gaming website to say the company “has released a game that captures the energy of Kiss to engage online gamblers in an exhilarating way“. You can play on either 20, 40, 60, 80 or 100 paylines which means a minimum wager of £0.10 up to a maximum of £250.